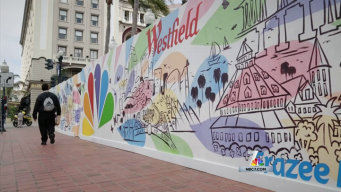 Young artists from the Monarch School talk to NBC 7 reporter Greg Bledsoe about a mural they painted on a wall covering the construction for Horton Plaza. 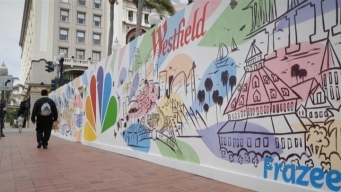 The students who painted the mural at a temporary wall in Horton Plaza were able to see their completed creation for the first time on Wednesday. Students at Monarch School, where many of San Diego's displaced children get their education, will paint a mural at Horton Plaza along a wall blocking construction. The mural features hand painted representations of San Diego's most celebrated places including, The Coronado Brodge; Mission Bay Park, Qualcomm Stadium, PETCO Park, the USS Midway and much more.